The last few weeks I have had the opportunity to work with a number of great companies. Their products are perfect for gift giving. Over the next week or so, I want to introduce you to a few of these companies, in hopes that their products make your holidays easier. Continuing our ode to gift giving, today I want to share with you another great gift to give that special someone. You can find my first suggestion here. Be sure to enter the giveaway at the end of this post. Have you heard of Blurb? 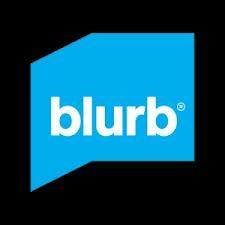 Blurb is a creative publishing platform that allows anyone to create, share and sell a professional quality book. a quick book of your instagram or facebook photos. The possibilities are limitless. It’s easy and quick to do. A few weeks ago our family took a trip to a family wedding. I put together my first Blurb book on my laptop in our hotel room. It was so fun and simple. In about an hour, I created a facebook album full of my hubby's favorite photos. I am going to give it to him for Christmas. I simply went to the Blurb website and clicked on "Make A Book." I then choose a template and that is when the fun began. With a very easy to use template, I was able to access all the facebook photos that I have posted, as well as any photos friends and family have posted that included me. With a simple click of the mouse I added all the photos I wanted included in the book. When you add the photos, you can also choose to add the captions that were on facebook, AND the comments if you want. You can leave the facebook captions off and add your own if you prefer. I was very impressed by how easy it was to organize and arrange the pictures. I finished things up by choosing and designing the cover. A few days later our Blurb book arrived in the mail. What a great gift a Blurb book would make. A book full of pictures of the grandkids for grandma and grandpa. A book full of favorite family recipes to share with siblings. Blurb books would also be the perfect way to "scrapbook" your families life. Once your book is completed, you can also share it with others on your facebook/twitter or website, blog- you can even sell it for profit. Want to win a $50 dollar gift card to Blurb? Of course you do. You can use it for yourself, or for that special someone this holiday season. a Rafflecopter giveaway Blurb is a creative publishing platform that allows anyone to create, share and sell a professional quality book. Make a portfolio of your client work, an archive of your blog, a cook book of your favorite recipes, a photo book of your family pictures or a quick book of your instagram photos – the possibilities are limitless. It’s easy and quick to do – with a variety of software options you could complete your dream book in next to no time. I love blurb books. I make one every year with the content from my personal blog. I've been doing this since 2008. These books are among my most prized possessions. I tell my husband if we ever have a fire,one of us gets the kids out, the other needs to grab the blog books. I love this. how fun to to be able to look through all you have posted for the last 4 years. I would be grabbing the Blurb books in case of a fire too! I have been wanting to use blurb to print out my blog!!! What a great idea! Blurb is perfect for that. What a perfect way to use Blurb! I've had my blog in a Blurb book 6 times and never pulled the trigger. It's expensive but totally worthwhile, since I use my blog as my journal. I would LOVE to win this so I could finally do it! I would love to have Blurb print out my blog! i love blurb! i would love this! I want to do a blog book! I've never used blurb but have made other photo books. I would love to try blurb and make a book of our Disneyland vacation. I would do a blurb book of our family cruise. We haven't been able to take a vacation in years, and saved and took our kids on a cruise. It was wonderful! This is about the only way I scrapbook now days. I also made a book for my parents with all their emails from their mission. Love Blurb. I would love to print off some of my blog! I've been meaning to do it forever! I would make a book from my blog! I made a blog book using blurb a year ago and I love it. Currently working on year #2, with five more to go. A gift certificate would be so nice! I know several people who have slurped their blogs using blurb but yours is the first album I've seen. Thanks for the review! I would turn my blog into a book! I would love to win this. It would be the push I need to finally make my blog into a book! And I have heard blurb is the way to go. I would love to turn my blog into a book! I am 2 weeks away from publishing my second blurb book. I did a baby photo book for grandparents for both my children and could not be happier. This GC would be AWESOME! I would love to make another blurb book. I love them! i have been experimenting with how to use this site to print my blog...the book you got looks great! I have been WANTING to give Blurb a try - with 4 kids and nary a scrapbook between them, I NEED to find a solution. I would like to make my blog into a book! I've been meaning to do this for years! My wedding photographer created and gave us a blurb book filled with his picks from our wedding photos and I love it. It's nice to be able to share some pictures without it being too overwhelming or getting too boring for guests. how fun! I plan on printing my blog! I absolutely love this and would start making holiday books with photos and recipes! 2011 Family photo book. I finished 2010 a while ago through blurb, but still need to make 2011. It would probably be nice to get that done before 2012 is over too.